James Garfield Young, affectionately known as Garfield, was born on March 19, 1964 in Leonardtown, Maryland to the late Francis Xavier Young Sr. and Julia Rebecca Young. He departed this life at home surrounded by family and friends on October 29, 2018. Garfield, the youngest of 12 children, was educated in the St Mary’s County Public School system. He was employed by Maryland State Highway Administration for over 24 years before his illness. He was always willing to go the extra mile to assist his coworkers with special projects and any other jobs that required his assistance. 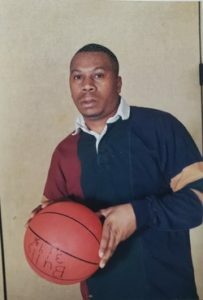 Garfield loved fishing and coaching youth basketball. He coached with the St Mary’s Park and Recreations for many years at the Margaret Brent Recreation Center. He often volunteered at the St. Mary’s County Fair and participated in Career Day at the St. Mary’s County Public Schools. He also volunteered for the Christmas in April program. He hosted many cookouts and parties at his home for family and friends. He was also an avid Washington Redskins fan, whether the team was winning or losing, he proudly wore the burgundy and gold. Most of all, Garfield enjoyed spending time with Michelle and Javone. Garfield leaves to cherish his memories a very special friend: Michelle Plater, his son: Javone Young, sisters: Elsie Young, Violet Butler, Hazel Bowman (Harold), and Ella Burton; brothers: Francis X. Young Jr. (Janice), Charles Young (Gloria) and Lester Young; and a god sister Alice Bush. Garfield also leaves behind Tevin Dorsey, Malcolm Queen, Latricia Holt (Rico), Lakita Holton (Nathan), and Latrell Knott, who he treated as his own children, and a host of nieces, nephews, relatives and friends. Garfield was preceded in death by his parents, Francis Young, Sr. and Julia Young, one brother: Ernest Young and three sisters: Clara Farmer, Hilda Butler, and Joyce Young. Family and friends will unite on Wednesday, November 7, 2018 for visitation at 10 am until Mass of Christian Burial at 11 am at St. Aloysius Catholic Church, 22800 Washington Street, Leonardtown, MD 20650. Interment will follow at Queen of Peace Cemetery, Helen, MD. Condolences to the family may be made at www.brinsfieldfuneral.com. Arrangements by the Brinsfield Funeral Home, P.A. This entry was posted on November 8, 2018 at 4:48 am and is filed under All News, Obituaries, z Obituary Ad Top. You can follow any responses to this entry through the RSS 2.0 feed.